It’s that time again! Time for another thrift store upcycle challenge! 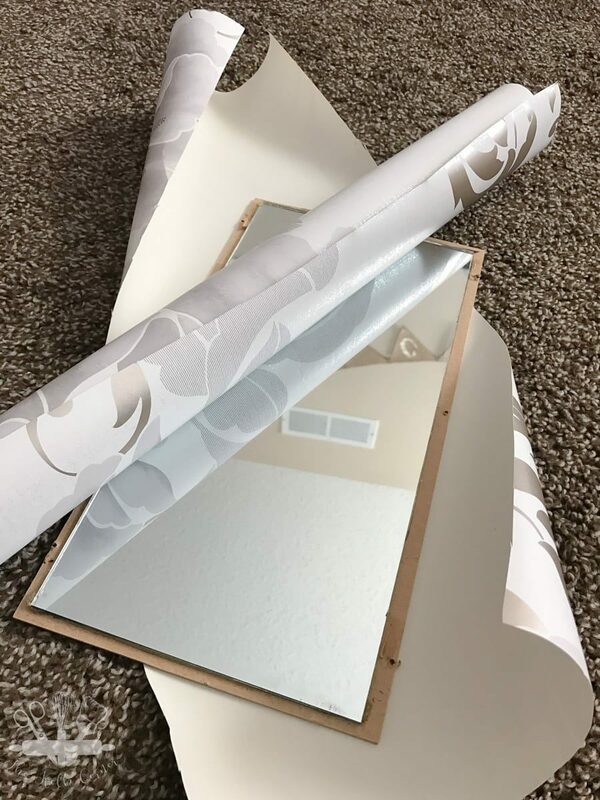 This month I took a plain mirror and transformed it into a custom craft room storage and decor piece with just a few items I already had at home. Now I have a beautiful inspirational piece of art as well as a little place to store my brush pens and markers. And of course, I’m pairing up with 30 other DIY/Home bloggers to give you tons of inspiration for when you hit the thrift stores next. There is so much talent in this group of ladies and I’m always so inspired after seeing their projects! First start by cleaning the frame really well. Remove any hardware that may be on it and set aside. Take the back off and remove the insert and set aside. Now it’s ready for paint! For my project, I used a latex paint in a stone grey because that’s what I had, but use any paint that you would like. Since I used latex I did sand my frame first to make sure the paint would stick to the surface. You will also want to sand it if the surface of the frame is rough or uneven. While the paint dried on the frame, I gave the two hooks a quick coat of gold spray paint. Next, I cut a piece of paper to fit the inside of my frame. Originally I had planned on painting the mirror white and putting a piece of plexiglass over it. Then I decided maybe I didn’t want to paint the mirror because what if (a huge what if) I want that mirror again in the future? So then I was going to use a gold and white dotted cardstock, but since the frame I used is such an odd size I would have had to cut the paper and piece it together. That wouldn’t have looked good. Instead I used some leftover wall paper from Graham and Brown that I used to recover a bookcase in my original office reveal. It fits in with the rest of my office and it looks pretty with the gray on the frame. Once that was done, I put the now wrapped mirror back inside the frame. Next, I re attached the hooks in the existing holes. 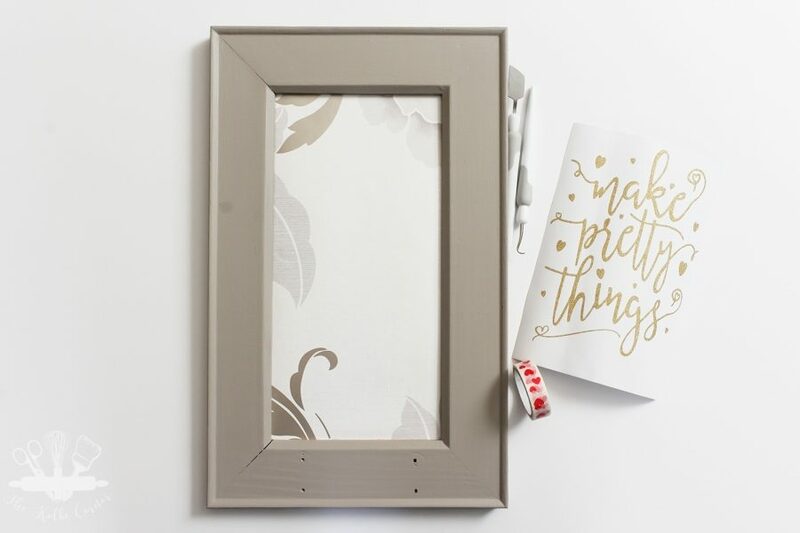 If your frame does not have hooks already, you will want to pre drill holes for each hook. You don’t have to drill in too far, just enough to get you started. Then after the holes are drilled, attach the hooks using either the drill or a screwdriver. Because I cannot leave well enough alone, I decided to add some gold glitter vinyl to the inside of my frame. 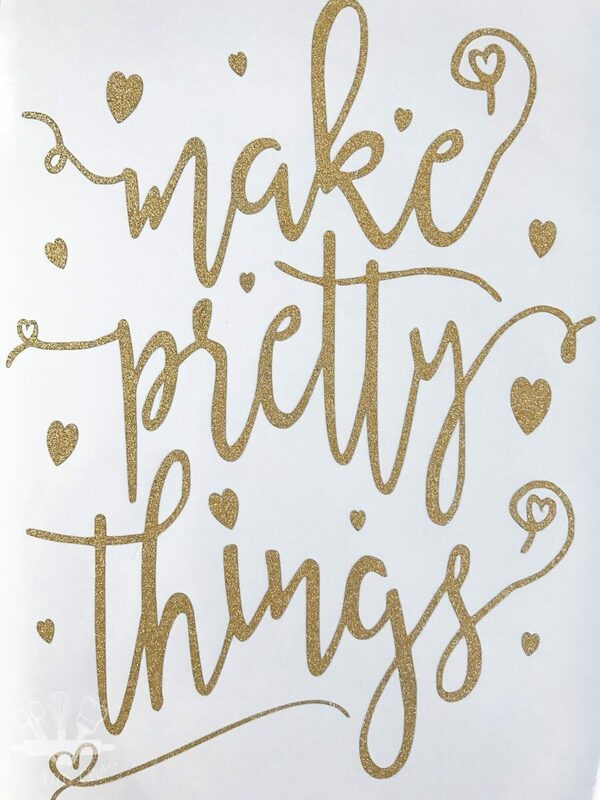 It says “Make Pretty Things” in a pretty whimsical font called Aintzane. Once the vinyl was cut, transferring it to the paper was a tedious task. 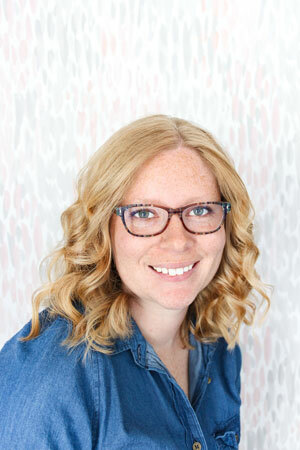 I started by trying to use Washi Tape–umm nope. That didn’t work in the slightest. So I bit the bullet and purchased actual transfer tape. I thought all of my transfer problems would be over. They weren’t. The problem was that the gold glitter surface of the vinyl does not want to stick to anything, so it was very hard to get it to stick to the transfer tape enough to pull the backing from the vinyl loose. It was about a 30 minute process but I finally got it loose. Then I simply placed the vinyl and transfer tape on the paper. Since it is paper I didn’t press the transfer tape onto the surface very firmly because I was worried about it peeling the paper back up with it. After all of that, I finally hung it up and used two jars with long handles I got from Dollar Tree to hold some of my markers and my beloved Tombow Brush Pens (and one lonely Copic marker from my college rendering class days). 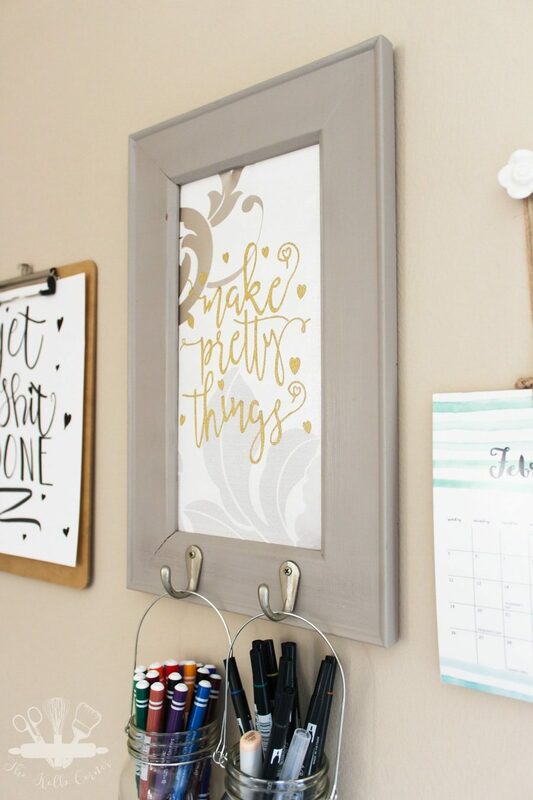 This DIY craft room storage and decor piece would also work well as a little command center, or you could customize it for a laundry room too! Each family member would have their own jar and whatever is found in pockets would go in their jar. There are so many possibilities and it only cost me $3 for the frame! The paint and paper were things I already had. Now it serves as inspiration for my everyday. because “make pretty things” should be everyone’s mantra. Very cute, I could do with making one of these for myself. Love this! 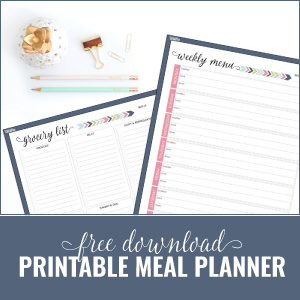 Super pretty and practical. Visiting from Thrift Store Challenge. The paint color on the frame is really pretty! I love using frames for hooks — so handy! Thanks Lora! Gotta love a clearance paint sample! What a great use of an old frame! I think the extra effort you put into the lettering was well worth it! Looks fantastic. 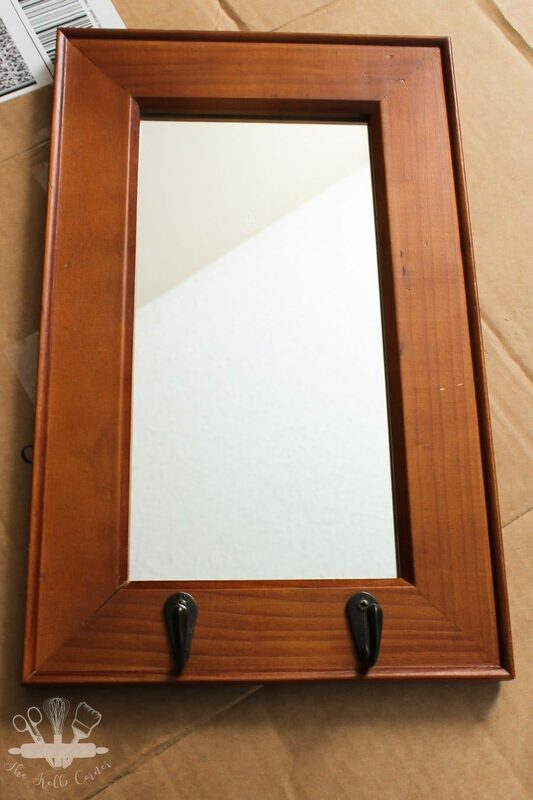 Such an awesome way to makeover an ordinary mirror. I love the design and phrase you used! I’ll definitely be on the lookout for a frame with hooks to upcycle soon. That is so pretty! I It’s a bonus that it is usefull too! 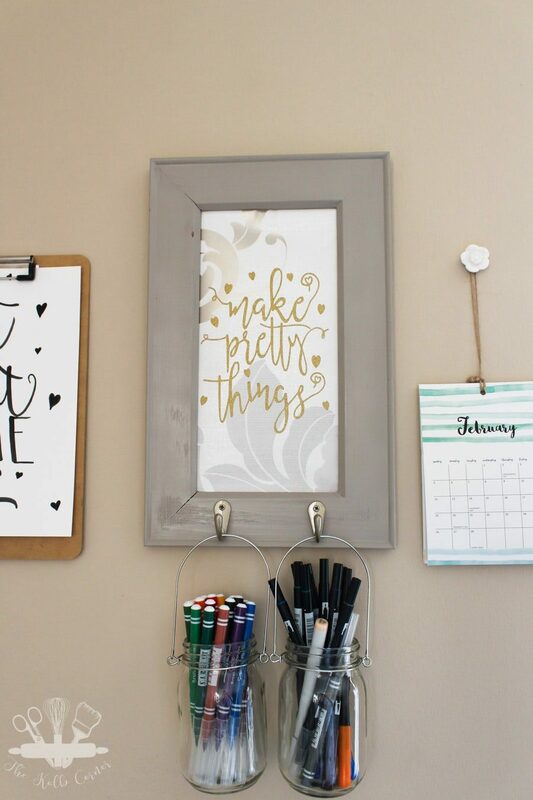 So creative to hang jars of pens on it! That turned out great, I love the glilttery words, sorry it was a bit of a pain but it was so worth it! The hanging jars are cool, I’ll have to search my Dollar Store to see if I can score some of those! Thanks Toni! I was surprised to see those jars at Dollar Tree as I hadn’t seen them before. They do have some online but in red. I hope you are able to find them! Gotta love an upcycle that is both pretty and functional! Great job! Love this! I’m always collecting unique frames and now I know what to do with one of them. This is fabulous. Grey, cream and gold are my favourite colour combination, and this is so inspiring. And that wallpaper!!! Gorgeous. 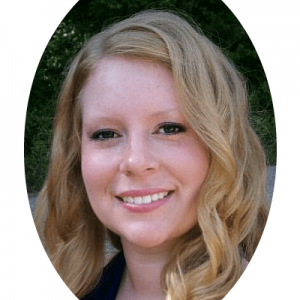 Amanda….love this idea….functional and super cute too. 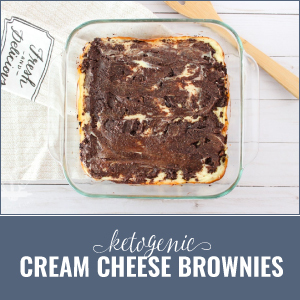 Oh my gosh, that is a brilliant idea! I may have to make something like this for my classroom! It would be so cute in your classroom! This is adorable!! I love the cutout you made ! I love this so much Amanda! What a perfect piece of art that is also useful for your craft room! What a pretty way to be organized. And as you say, it is a versatile project and will work all around the house. 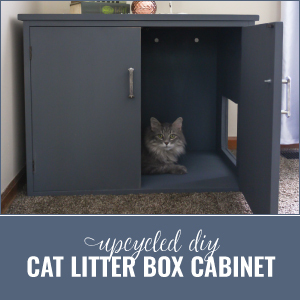 This is such a great upcycle! The hanging mason jars are so smart!